It is undoubtedly a kitchen equipment that has revolutionized our daily lives: the squeeze bottle also known as the condiment squeeze bottle! 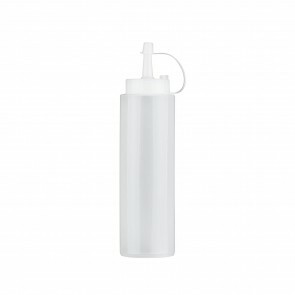 The squeeze bottle holds condiments such as ketchup, mayonnaise, mustard sauce, BBQ sauce, chilli, soy sauce, balsamic vinegar, cooking oils, chocolate sauce and many others. Made of food grade bpa free clear plastic, this condiment dispenser is very resistant. AZ Boutique offers you opaque and transparent squeezer with lids to better accommodate your food and to season all your new recipes with condiments and sauces. 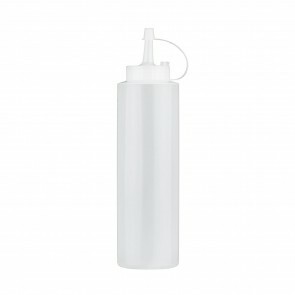 Opaque coloured plastic bottle: This type of bottle is ideal for tomato sauce, mayonnaise, chilli or mustard. The colour of the bottle makes it easy to guess the contents of the bottle. 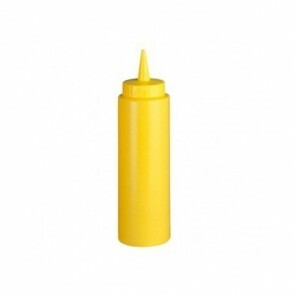 For example, the red bottle will be used as a hot sauce, BBQ sauce or ketchup squeeze bottle while the yellow bottle will be used as a mustard or mayonnaise dispenser. Be logical in your choices, the colour of the sauce must match the colour of the plastic jar you use so as not to mislead your guests or customers! Transparent squeeze bottle: The translucent plastic bottle also known as the icing decoration bottle, is widely used in restaurants for cooking or in pastries for decorating cakes and dishes. The transparency of the bottle helps to better see the contents inside so as not to make mistakes. You can refill it and store chocolate sauce, salted butter caramel, red fruit coulis for pastries and dressing sauces, balsamic vinegar, soy sauce or homemade seasoned oil for all your savoury dishes. 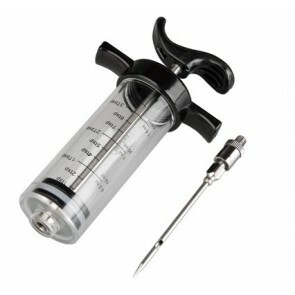 Simply squeeze it and use it for cake toppings or as a dropper bottle too ! All the advantages of squeeze bottle in the kitchen! In the kitchen, in restaurants and hotels they are widely made available to the customer! Once the meal is served, with the sauce bottles on the table, customers reserve the right to season their meals as they wish. The oblong condiment dispenser, being made of a very soft plastic material, allows customers to squeeze more easily in order to enjoy their dishes with a seasoning at their convenience! Hotels and restaurants sometimes also place them on the buffet counter to allow people to help themselves and this avoids using plastic bags of ketchup or mustard in a eco-friendlier approach. These plastic bottles also allow you to have a better dosage because of the nozzle and the easy squeeze you can control the dosage by pressing hard or softly on the bottle. For the most romantic, write a pretty message of love for your beloved with ketchup on her hot dog! This system is widely used in professional kitchens. Certainly not to write sweet little words but more for decorating plates for appetizers or desserts. As mentioned in the previous paragraph, these cylinder plastic squeeze bottles are called icing decoration bottles. They are very easy to use thanks to the pointy caps used as spouts and easy to handle so that the decoration of the plate is easy. Some plastic bottles or measuring bottles have scales and allow you to have total control over the amount of liquid you want to add to your dish without any leaking ! 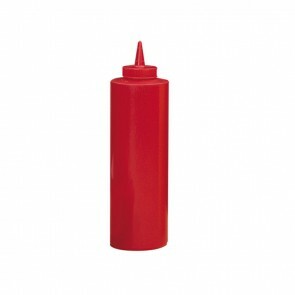 Condiment bottles are also used at fairgrounds, by street vendors, food-truck owners, street kebabs and sandwich shops. It's much easier and faster to use a non-spill bottle, which allows you to pour a dose of sauce to season French fries or hamburgers without splashing for instance ! These bottles are also used for storing condiments in the refrigerator instead of using food containers. Once the restaurant is closed, simply store the sauce bottle directly in the refrigerator to serve the next day. This is a good way to keep products in a healthy container without the risk of food contamination. Why choose plastic for a sauce bottle? The plastic is perfectly resistant to impact, prevents breakage and avoids leakage. This prevents food loss. If you keep your condiments in the refrigerator, plastic guarantees perfect freshness. Plastic is very light and therefore you can easily transport your products rather than glass bottles and they are also reusable. Some products are transparent and therefore allow you to see through. Finally, it is the cheapest material on the market! Opt for the plastic bottle dispenser to put a good barbecue marinade, your new sauce recipes, cider vinegar, tomato coulis, vinaigrette sauce, chutney, wine vinegar, salad dressing, syrups and so much more! 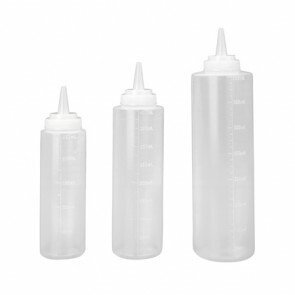 Squeeze bottles from 24 to 72cl, red, yellow or white, AZ Boutique bottles will allow you to pour any sauce or liquid cleanly and precisely. Discover also our other bottling products on AZ Boutique to help you in your kitchen: jars and jugs, shaker, plastic containers and glass containers, food flask, water bottles, oil bottles, spray bottle and more.